Although “Detective Conan” has been adapted to live-action special dramas three times in the past (two special dramas starring Oguri Shun and one starring Mizobata Junpei), this will be the first time it is set be aired as a drama series. 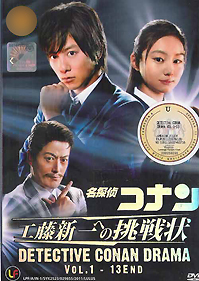 Detective Conan TV drama series is titled "Meitantei Conan Shinichi Kudo e no Chousenjou", will take place three months prior to Kudo Shinichi Edogawa Conan turned into, and will be a drama where each episode of unresolved murder cases. Through all three previous special Dramas (2, starring Shun Oguri, and one played by Junpei) having an original story, the drama series will contain several stories directly from the manga.